To shop for used boats, you have to have an active imagination. If it’s wintertime, a particularly vivid one. The April boat shopper may walk down a dock under sunny skies, to the tune of chirping birds, to look at a 38-foot sloop with freshly washed decks. Even if it were 60 degrees, imagining the freedom of throwing off the lines, while wearing shorts and a wide-brimmed hat, is not a big mental leap. Now back up four or so months and subtract 30 degrees. Under gray skies and layered wool, you carefully trudge down the dock, while eyeing the ice on the creek. Boarding that 38-footer may be treacherous due to ice or slush. Hoping the deck would look nice if hosed down, you go below thinking it may be warmer down there. It’s not. You open and close drawers and lockers, as boat shoppers do, and pause to blow on your fingertips for warmth. When you can see your breath, those shirt-sleeve, straw hat, mix-me-a-margarita sailing day images take more creativity to muster. A few winters ago, I captured a glimpse of this tough process, as a friend searched for a used, cost-effective, 35- to 40-foot sailboat to live aboard. 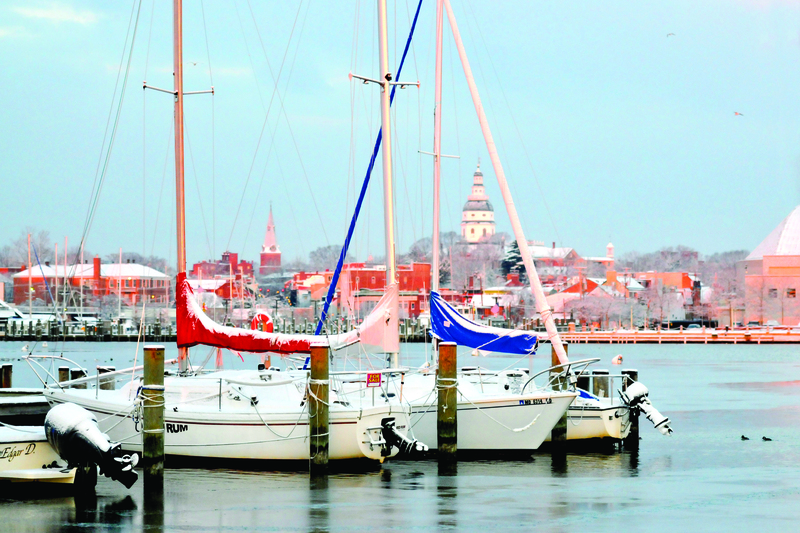 Live-aboard sailors on the Chesapeake Bay lead interesting, surprisingly normal lives that are not as ruled by winter heating issues as much as we dirt dwellers may believe. When it came to cabin space, my friend’s specification list was fairly predictable, with some of it rated on a one-to-five scale. The galley would have to be sufficient for day-to-day cooking. A separate shower, rather than just a nozzle over the head, would be a bonus. A comfortable saloon with elbow room for reading, movie night, and dinner with close friends was a must, as was ample storage, since the boat would become his only closet. The more I looked at the spec sheet and agreed and disagreed with my friend on certain necessary aspects of boats—shoal draft keels and cuddle room among them—the more I realized that I, like every sailor he had talked to, had my own sailboat owning fantasies I was trying to project on him. More than half of what I considered crucial to boat buying was not quantifiable or spreadsheet-friendly. The snob scale. Even if we don’t have the money to back up the attitude, many of us have one. Most sailors I know have snubbed their noses at certain boat brands. One of my friends joked that he wouldn’t mind rafting his J/40 alongside a Bristol 35.5, but the O’Day 40 guy would have to fly solo. I advised another friend to reconsider buying an ugly boat he was ready to write a check for. “To attract women,” I told him, “you need a sexier boat.” Your future boat must be acceptable on your own snob scale. Then, there’s the wish-I-had-known factor. No matter how many experts’ opinions you gather or how hard you try to predict future annoyances—such as the step you will stub your toe on, the ledge that will repeatedly bruise your forehead, or the boat sailing like a pig downwind—you may not figure out what’s to dislike about your boat until you own and sail her. The knowledge that you will swear at her later and have pangs of regret keeps you up at night and fits nowhere on a spreadsheet. And where on that electronically shareable Google document does love fit? Can you quantify the warm and fuzzies? Really, if a friend tells you he or she is in love, do you ask, “On a scale from one to 10, how much?” Does a je ne sais quoi feeling fit under the “equipment/item” column? In any season, there are two terrible truths about love and sailboat buying. The first is that the more money you have to spend, the more je ne sais quoi stardust you can conjure up in a boat. The other is that all sailboats are labors of love. You must love your boat in the beginning. You must get a little giddy and feel that this boat, this means of escape and joy, is destined to be yours. You have to see it. Then later, when times are tough, and you discover her weaknesses, when the engine breaks down and you find yourself dishing out three times your budget for unsavory items related to bilges, heads, and rust, you can remember the beautiful beginning. That, too, may require a healthy imagination. Winans is the Editor of SpinSheet and PropTalk based in Eastport, Maryland. This article first appeared in the February 2011 issue of SpinSheet.